Between December and March, millions of people suffer from the common cold, influenza (flu), pertussis (whooping cough), and Norovirus (stomach bug). Depending on the severity of the season, people can be affected until May. You may ask yourself why so many people are sick during the winter. Is cold winter weather really to blame? Medical experts believe cold weather does not actually make us sick. What makes us sick is the change in our lifestyle. Germs are always around us. However, when cold weather sets in, our windows stay closed, the heat goes on, and we spend more time indoors (i.e. our homes, shopping malls, sporting events, concerts etc.). 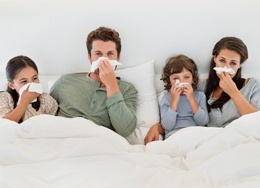 Infected air in our homes as well as large groups of people in an area makes the transmission of germs easier. Because I have family members who work in healthcare, I know that many people are confused about the symptoms associated with these illnesses. Below is a brief explanation of the flu, as well as how it’s spread and treated. To learn more about symptoms of the common cold, the flu, and whooping cough, check out our infographic below. I hope that being able to identify the differences between each illness, helps you and your family members get the appropriate care you need to get on the road to recovery. Influenza (flu) – When people experience nausea, vomiting, or diarrhea, they often refer to this as the flu. That’s incorrect. The term flu refers to influenza, which is a respiratory disease. Different viruses, bacteria, or parasites cause gastrointestinal distress. How’s the flu spread? It’s spread by airborne droplets of moisture that float through the air when a person sneezes, coughs, or talks. When the droplets encounter your eyes, nose, or mouth, infection can occur. Illness symptoms usually appear within 1-3 days. Below are some additional health resources for your family.